Christopher Sampson enjoys a multi-faceted career as a performer, educator, producer, and arts administrator. Sampson is the founding director of the Popular Music program at the USC Thornton School of Music. As a professor of songwriting, Sampson’s students have penned number one hit songs, won national songwriting competitions, placed songs in numerous television shows and films, written musicals, secured recording contracts, are among the top most subscribed musicians on YouTube, and currently work in multiple areas of the music industry including A&R, publishing and administration. Through the Popular Music program, Sampson has presented collaborative seminars with Glen Ballard, Lamont Dozier, Flea, Randy Newman, Steve Miller, John Fogerty, Andy Summers, and Patrice Rushen to name a few. As a traditional blues artist, Sampson performs regularly throughout Los Angeles, has been recorded on several movie soundtracks, and presents workshops on blues history, culture, and performance practice. In addition to his teaching, Sampson also has extensive experience as an arts administrator, providing leadership at USC Thornton in curriculum development, career launching initiatives for musicians, community outreach programs, and international partnerships. Prior to his current appointment, Sampson served as the assistant dean for enrollment and financial aid at USC Thornton and the vice president for academic affairs for the Wisconsin Conservatory of Music. He has also served on the faculty of the recording industry program at Middle Tennessee State University. 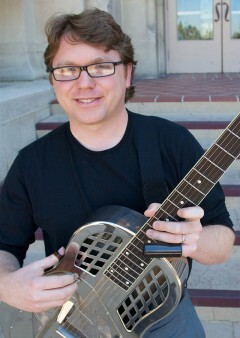 Sampson earned his bachelor’s and master’s degrees in classical guitar performance from the USC Thornton School of Music.